Are you an SLP needing no prep articulation worksheets with a theme? Pairing quick and motivating activities with speech sound/articulation drill can yield engaged students and a high number of trials! 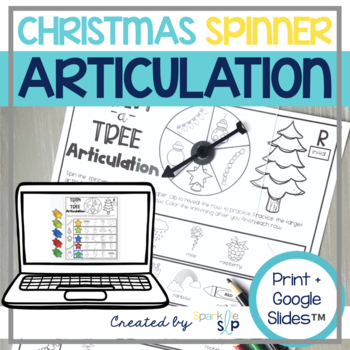 Use Trim a Tree Articulation for a Christmas theme! 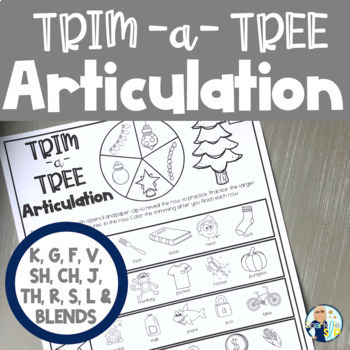 Trim a Tree Articulation Worksheets targeting K, G, F, V, SH, CH, J, TH, S, R, L & BLENDS can easily be printed for no prep articulation practice. Just add a pencil and paper clip to create a spinner (or buy your own clear spinners, not included) and you are ready for skill and drill! Print desired target sound pages, pair with a paper clip and pencil and start drilling! Students may also color in the spider after each row completed. 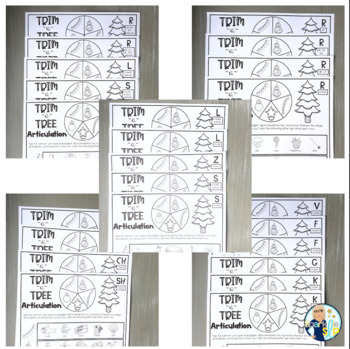 You may also print each worksheet on colored paper or card stock and place in sheet protectors or sleeves for continued use in therapy sessions! This packet contains the same targets as my other articulation “spinner” no prep articulation sheets. Using themes makes planning easy each month and using consistent targets sets up perfect baseline or progress monitoring. ⚠️This is a Zip File.